This article was co-authored by Claire Suellentrop and Georgiana Laudi. It’s an industry truth: tech companies are often founded by people who know very little about marketing. The founder might not even know enough to hire a marketer. But at some point, customer acquisition becomes an emergency, and they fumble their way through hiring someone who has less experience than originally hoped for. Even at the rare tech companies led by people who do come from marketing backgrounds, founders lack the bandwidth to support their head of marketing as much as they’d like to. 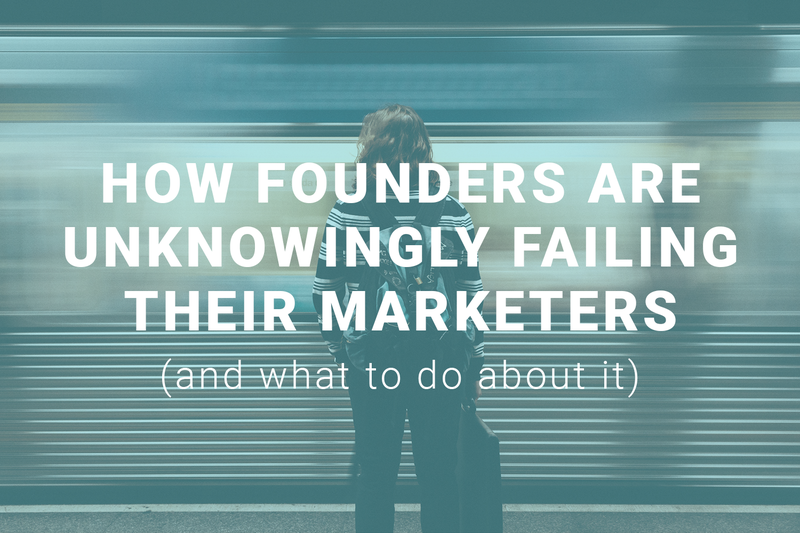 So, founder, what are you gonna do about it? For founders with product or technical backgrounds, marketing can feel like a foreign language. But in the early days of founding a company — when funds are tight and a poor hiring decision could kill the business — it’s common for founders to try their hand at marketing anyway. The smarter decision, for the sake of your company and your own sanity, is to hire a marketer early. Naturally, as a founder handing over responsibility of anything, you want someone pretty experienced, but it doesn’t take long to realize that experienced marketers in tech are rare, and expensive. For the vast majority of startups, that option’s out. What’s the next best thing? Someone less expensive and less experienced, but hungry to learn and grow with the company. Hiring a junior or mid-level marketer is a great option, but you’d better make sure they have the skills and tools they need to drive revenue and keep the company alive. Heh. No pressure. Let’s assume now that this was you, and that you’ve decided to get out of your own way, get a marketer in once and for all to help take what you’ve built, and tell the world. Congrats! Jason would be proud. Let’s be honest. Even some senior-level people don’t come with all of these skills. So to be effective and make a real impact on revenue, your junior or mid-level marketing hire will need support — more support than you, the founder, can offer. Step-up, step out of the way, or suffer. As a founder, you don’t have the time to nurture a junior marketer over learning curves, or help them develop strategic ability. And where a senior marketer wouldn’t need such hands-on guidance, a junior or mid-level one won’t be able to develop those necessary skills without it. They look to you for help. You, the person who knew they needed to delegate marketing to someone else in the first place. So what do you have to offer them? Not much. The best you’re likely able to do is point them toward blogs you think they should read, or prescribe marketing tactics that you’ve heard have worked well for other companies. You sure won’t be able to help them think more strategically than that, because hell, you don’t know that much about marketing strategy, yourself. As a result, you’ll get a marketing “strategy” that’s really just a list of disjointed tactics. And those tactics won’t create the growth you’ll need. So you’ll wind up with a marketer whose confidence is shot and who second-guesses every decision they make. And you’ll either need to replace that person once they burn out…or you’ll need to spend more time, more money, bringing a manager in over them to generate now-overdue results. By investing in your marketer’s professional development, you maximize not only their ability to drive results for your business, but also the likelihood that you’ll retain them long-term. Just as beneficial, investing in professional development for your team builds a culture of growth. And that culture of growth is what will attract future talent to come on board and stay for the long haul — more than ping pong tables or beer kegs ever will. More and more, opportunity for growth outweighs what conventional wisdom says people look for in a job, like a higher salary. Especially among millennials. And of course, when you invest in your team’s professional development, you win in the short-term, too: with the burden of micro-managing and mentoring safely elsewhere, you can extract yourself from being everything to everyone. Be there for the really important stuff that only you as the founder can do, and get back to focusing on the overall health of the company and its growth. Depending on expertise, past experience, gender, generation, cultural background, and personality-type, people need and benefit from different types of support. There are tons of ways to invest in the professional development of your team, and each offers its own benefits and drawbacks. What matters most is that you’re giving them the opportunity to choose the path that’s best for them and not unintentionally influencing their decisions with your (potentially unconscious) bias. Let’s break down some of the most common ways to invest in your marketer’s professional development, so that they can be the leaders you need them to be, think strategically, and drive real revenue growth. Conferences, meetups, and other industry events (hackathons, anyone?) are great for networking, and for the inspiration factor: sending an employee to an event, where they can learn from expert speakers, is a surefire way to get them fired up about the work they’re doing. But for professional development, industry events often fall short. Attendees typically walk away feeling like they’ve been drinking from a firehose: they’ve learned a ton, but actually putting those learnings into practice and seeing them through long enough to generate results is a big challenge. At the end of the day, you may end up with a marketer who’s feeling inspired, but isn’t any more effective than they were before you spent money on the plane ticket, the hotel room, the conference badge, and the happy hours. Podcasts and blogs are popular for one huge reason: they’re free. If your marketer is making the time to track down, read, or listen to free advice and expertise, that’s a sign they’re keen to improve. But free information is scattered information. Reading 10 different blog posts can teach someone to execute on 10 different tactics… but it doesn’t provide strategic-level thinking they need to evaluate whether those tactics are truly relevant to your business model and customers. A marketer who only has access to free content is likely to end up spinning their wheels. Don’t we all wish we had a mentor back in our early days? If seven-years-ago-me (fresh in my role leading marketing at a high-growth startup) had access to someone like now-me, seven-years-ago-me would’ve been 10x more effective. Think about that. If you could fast-track your marketer from junior- or mid-level performance to senior performance, how much would that be worth to your company? Let alone what it’d do for them, their confidence, and their loyalty. One-on-one guidance from someone who’s been there is a fantastic way to invest in your team, with almost immediate results. To truly have an impact though, this person needs regular meetings with your marketer for at least 6 months — meaning mentorship may also come with a higher price tag. But if you consider the cost of not supporting your marketer in this way, you might decide it’s well worth it. Sponsorship takes mentorship to a whole other level. Mentors are advisors and sounding boards; sponsors are senior leaders who are willing to leverage their influence to advocate for promotions and stretch assignments of more junior team members. Some say that there’s no better professional development opportunity, particularly for women. And that’s because women are far less likely to self-advocate for things like promotions, raises and professional development itself (…take note). Sponsorship programs are proven effective, but until your company is a certain size, it’s not likely something you can implement for your team just yet. Paid training programs, whether online or in-person, give the extended support and dot-connecting that industry events can’t — and since they’re usually group programs, they’re less costly than one-on-one mentorship. They also typically offer a level of peer support not easily matched in free communities. However, since anyone on the internet can create a training program, it’s important to do some homework. Check the credentials of the instructors, and also whether or not past students (and their companies) have actually benefited. For marketers at startups, tasked with generating revenue at an early stage, training programs should be rooted in strategic thinking and leadership (see below for one that does both). The last thing you need is a bunch of disjointed tactics, like how to run Facebook ads or start a blog. Whatever way you choose to support the professional development of your marketer (and team), don’t forget that they need time to level up. I’m not talking about being patient as their skills develop, I’m talking about actually giving them time in their work week to focus on improving. At Unbounce, every second Friday is a professional development day. At Buffer, employees take three-month learning sabbaticals. Invest in the professional development of your team. If marketing isn’t yielding the results you hoped it would by now, or you suspect your marketer might be struggling to meet the (let’s face it, dizzying) list of demands of an early-stage company, it’s on you, and only you, to admit it and fix it. So before your marketer burns out or you need to spend more time and money bringing a manager in over them, invest in them. With the burden of hands-on support of your marketer safely off your plate, you can stop being everything to everyone — and get better results from your marketing, too. You’re not fluent in “marketing,” anyway. And nor should you be. Claire Suellentrop and Georgiana Laudi address the unique struggles of SaaS marketers, based on their firsthand experience building brands (pretty much from scratch) as the Director of Marketing at Calendly and VP of Marketing at Unbounce. SaaS Marketer Essentials is a 12-week program that helps marketers at high-growth SaaS companies stop spinning their wheels, think more strategically, and drive business results. Limited enrollment for the Spring 2018 session opens in March. Marketers can join the waitlist here. Forget The Funnel also offers free weekly workshops for SaaS marketers, on topics ranging from content strategy, to optimization, to analytics. Sign up for free here.